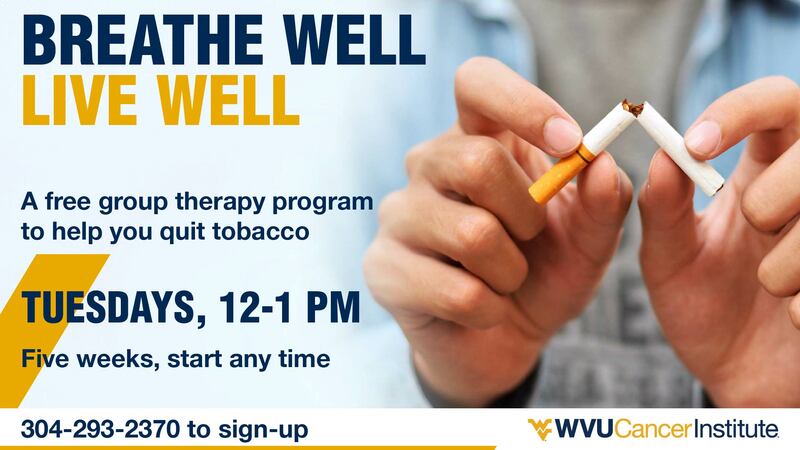 The WVU Cancer Institute is offering free tobacco cessation support group meeting for patients, WVU students, WVU employees, and the general public. This support group is part of a series of support groups available at WVU Medicine. During the weekly sessions, the group will discuss nicotine replacement therapies and steps to take in quitting tobacco use. Groups meet on Tuesdays, starting February 5, 2019 from 12:00PM to 1:00PM in the WVU Cancer Institute Clinic Registration Area. Groups are led by a WVU Cancer Institute Certified Tobacco Treatment Specialists (CTTS) from Cancer Prevention and Control. West Virginia currently has the highest adult smoking rate in the country. Quitting smoking lowers the risks for cancers of the lung, mouth, throat, esophagus, and larynx. Within five years of quitting, your chance of getting cancer of the mouth, throat, esophagus, and bladder is cut in half. Ten years after you quit smoking, your risk of dying from lung cancer drops by half. All interested individuals are encouraged to call 304-293-2370 to register.